This oboe and flute program has been a long time coming. Join me and my dear friend Martha as we explore gorgeous, tempestuous, intelligent, beautiful music by 20th and 21st century female composers. You don’t know these works - yet - but you’ll leave humming them like we do. Details HERE. Performing in a small group is some of the most exciting work we do as musicians. We'll be presenting some of our favorite works here, by Ravel, Cambini, Eric Ewazen, and more! "Things Are Looking Up: Unsung Gershwin"
Musicians for Michiana Fall Fundraiser. Space extremely limited. Email me to be placed on the VIP list! I'll be the soloist on a very lovely work by Peruvian composer Jaime Diaz Orihuela, Adagio para Una Danzante. The concert promises to be fascinating. Details HERE. 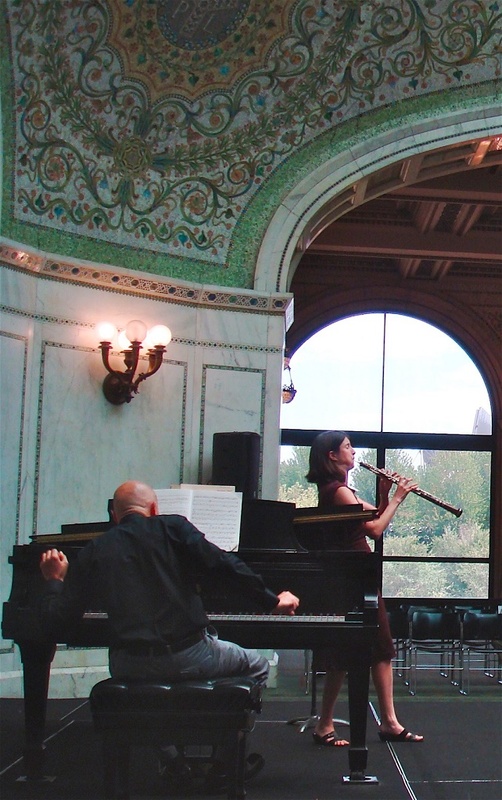 Join oboist Jennet Ingle and clarinetist Jason Gresl in an all-ages event featuring myths, animal fables, and musings on modern technology. Works by Britten, Dorati, Gresl, Sanders, Debussy, Loudová, and MORE. Free of charge. The musicians at this event are familiar faces for MFM fans: Jameson Cooper, violin, Rachel Goff, viola, Brook Bennett, cello, and Jennet Ingle, oboe. Since the beginning of time, people have come together because both music and life are more magical in a community. We will present music of Britten, Dohnanyi, Mozart, Halvorsen, and Ludwig in this concert for St Margaret’s House. Pay What You Like. This concert will partner with St Margaret’s House, and all proceeds from the event will be given to that great organization. The Christopher Rouse Oboe Concerto was composed in 2004 and is a beautiful, interesting, fun piece. Like any complex work of serious music, though, it can frighten and intimidate a potential listener. "You mean I have to listen to 20 minutes of non-tonal solo oboe with a percussion-heavy orchestral accompaniment? Really?" In this recital, I will explain and explore the piece, featuring along the way performances of more familiar works by Telemann, Bozza and others. This hour of music will leave you inspired and ready to dare another new music concert in the future. In this recital, I will explain and explore the piece, featuring along the way performances of more familiar works by Vivaldi, Bozza and others. This hour of music will leave you inspired and ready to dare another new music concert in the future. In this recital, I will explain and explore the piece, featuring along the way performances of more familiar works by Telemann, Bozza, John Williams, and others. This hour of music will leave you inspired and ready to dare another new music concert in the future. Pay What You Like. This event is part of Musicians for Michiana's 2016 series, and will benefit the South Bend Symphony. I'm thrilled to be performing this great 21st century concerto with my marvelous colleagues at the South Bend Symphony. My students are getting so good! I'm proud to showcase their work this year with music of Saint-Saens, Handel, Nielsen, Gordon Jacob, Britten, and MORE. Of course I'll be playing too, and we have the phenomenal Ketevan Badridze accompanying us all. This will be an evening to remember! This is always a great event, featuring chamber music by all of the great SBSO principals. My quintet will be playing Nielsen, and WHO KNOWS what else will be on this concert? I'm so excited to be working with pianist Mariah Boucher on this program. INTERESTING and BEAUTIFUL repertoire by Jeffrey Agrell, Karl Pilss, Thea Musgrave, Benjamin Britten, and JS Bach... This will be super fun. Tickets at the door - 15/10. The Muses’ Workshop newest concert offering, "Pairings," will spark your interest and engagement with musicians giving friendly introductions to instrumental solos, duets, and trios in an informal setting. These “pairings” feature captivating works by female composers from the USA and abroad in a celebration of Women’s History Month. Featuring local favorites Jennet Ingle, oboe, Jason Gresl, clarinet, Rose Wollman, viola, and Lara Turner, cello. This is going to be FASCINATING! In honor of Women's History Month, a program of female composers: Rebecca Clarke, Hilary Tann, Alyssa Morris, Belinda Reynolds - and more! Oboe, Clarinet, Viola, and Cello. This is going to be FASCINATING! We'll be playing the beautiful and evocative trio, The Walls of Morlais Castle, by Hilary Tann. Free and open to the public!